Tag line: "Long live adventure... and adventurers!" “We’re not little men, and there’s nothing we’re afraid of”. The above line is spoken by Peachy Carnahan (Michael Caine), a former Sergeant in Queen Victoria’s colonial army, just before he and his closest friend, fellow soldier Danny Dravot (Sean Connery), set out on a journey that would carry them to Northern Afghanistan, which no white man has visited since the days of Alexander the Great. 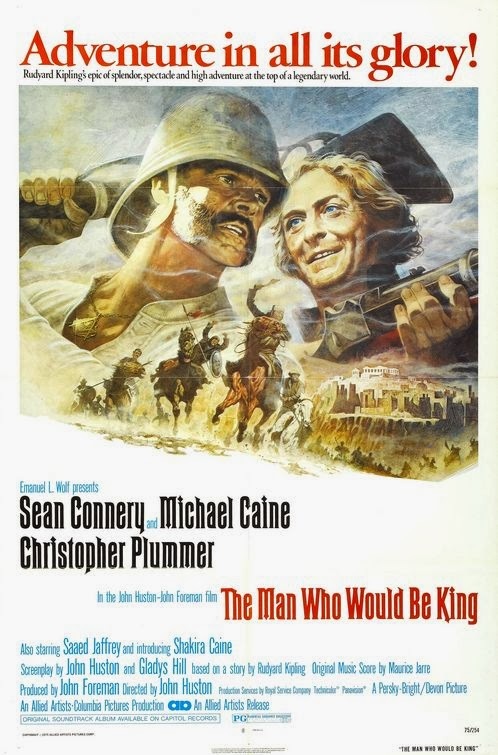 Based on a short story by Rudyard Kipling (who is himself a character in the movie, played by Christopher Plummer), John Huston’s The Man Who Would Be King is a grand adventure, featuring two actors at the absolute top of their game. Having resigned their post in India, Peachy and Danny, always looking for a get-rich-quick scheme, stumble on an idea that, if successful, will make them wealthy beyond their wildest dreams. As they tell their new friend (and fellow Freemason) Rudyard Kipling, the two intend to travel hundreds of miles north to Kafiristan, where a number of warring factions are vying for control. Bringing rifles and ammunition along, they plan to train an army capable of conquering the territory, at which point they’ll set themselves up as kings. After a long and dangerous journey, they reach Kafiristan, and for a while, everything goes according to plan. But when Danny is shot with an arrow during battle and is seemingly uninjured by it (the point struck a leather strap under his uniform, never penetrating the skin), the locals begin to believe he’s the son of Alexander the Great, and worship him as a God. To Peachy’s dismay, Danny himself starts to think of himself as the second coming of Alexander. So, instead of packing up their new-found riches and heading for home, Danny decides to stay and rule over his “kingdom”. The Man Who Would Be King is, first and foremost, an adventure film, following its lead characters on their quest for glory and treasure. The journey to Kafiristan is a perilous one; while traveling through the snowy Khyber Pass, the two nearly freeze to death (they’re saved by, of all things, an avalanche). The excitement continues when they finally reach their destination, where they meet a Gurkha soldier named Billy Fish (Saeed Jaffrey) who once assisted the British Army, and can therefore speak English. Acting as translator, Billy helps the two convince Ootah (Doghmi Larbi), the leader of an oft-invaded village, to accept their help. After training Ootah’s men, Peachy and Danny lead their new “army” into battle against a neighboring town. It’s during this melee that Danny is struck by the arrow, stunning those on both sides when he simply pulls it out of his shoulder and tosses it away. All at once, their scheme to take control of the area got a whole lot easier. Along with the adventure, The Man Who Would Be King is a story of friendship, of two men who’ve been through hell together in Her Majesty’s Army and, having grown tired of taking orders, are now going into business for themselves. As the compatriots, Caine and Connery are outstanding, deftly handling both the film’s humor (especially early on, in their scenes with Kipling) and its high drama (when Danny becomes King) while, at the same time, giving their characters a larger-than-life quality, convincing us these two “ordinary” soldiers could conquer an entire country. As Peachy said, he and Danny are not little men. And The Man Who Would Be King is not a little film. I obviously missed this review before. Sorry about that. The chutzpah of the lead characters played by Connery and Caine has to be admired, and their friendship and history together in battle makes it work. Alas, Connery lets it go to his head, and he gets hoisted by his own petard. It's an adventure, a buddy movie, and a morality play all rolled into one. Should be on anyone's list to see.